While my DH was out in the yard filling the birdfeeders this is what he discovered!!! 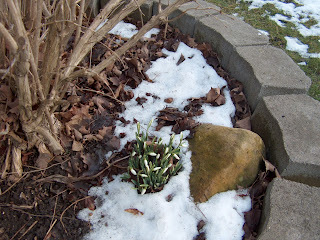 The snowdrops are up... sure sign spring is on the way...YEAH! That surprises me that you would see snowdrops in mid-February. I will have to check tomorrow to see if the ones in my yard have popped up. I live an hour north of Toronto so I don't think it's that far from where you live. Yes I was as surprised as you were Inga... I can't believe the winter we have had... I keep wondering when the other boot will drop!! Meanwhile I am enjoying it and travelling on the highways is a dream come true!